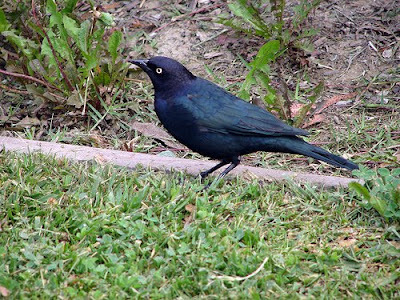 Out of my office window at Avimor, I've been watching four Brewer's Blackbird resting in the cool shade of some low shrubs and chasing grasshoppers around in the grass and on the sidewalk. I have not seen them in their usualy spot along the side of Highway 55 near Shadow Valley Golf Course for a couple of weeks, so I figured they had migrated. Seeing them this afternoon made me curious, so I went to one of my favorite websites, All About Birds, to learn more. They are listed as seed eating birds, but do consume a lot of insects. Looking at an eBird report, Brewer's Blackbirds are see in Idaho all year, but observations decrease dramatically by mid-October until they return in greater numbers in March. This is also only my second sighting of Brewer's at Avimor this year. The large female Swainson's Hawk has been riding some afternoon thermals. 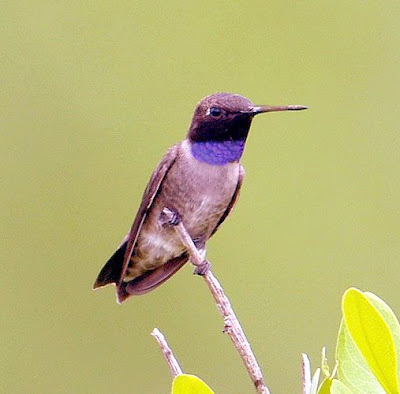 A Black-chinned Hummingbird visited the purple flowers just below my window. Barn Swallow's have been cruising the vacant lots across from me and perching on the yellow parking area rope all day. This year I am serving as the Membership Chairman for the Building Contractors Association of Southwestern Idaho. 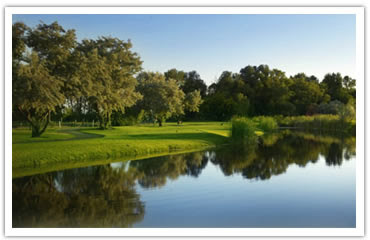 We had our annual membership golf tournament at Shadow Valley Golf Course, just down the hill from Avimor. My role today was to hang out at the 3rd tee box, meet & greet BCA members, and sell raffle tickets for BSU football games. In between groups teeing off, guess what I was doing? Yep...birding! I have always loved golf courses for birding because of the beautiful habitat that appeals to many varieties of feathered friends. I wish I could bird golf courses more frequently without getting bonked on the head by a stray ball, but alas, birding golf courses always has to be a secondary activity. The 3rd tee box at Shadow Valley overlooks a riparian ravine full of tall cottonwoods, sumac, willows, and all kinds of shrubs and grasses. Standing above the ravine is a great vantage point for observing bird activity. Black-chinned hummingbirds were zipping by me all morning. American Goldfinch were very active and vocal. A couple of red-shafted Northern Flickers squawked from high up in the trees while several American Crows and Mourning Doves lazily flapped overhead as the gorgeous summer morning heated up. 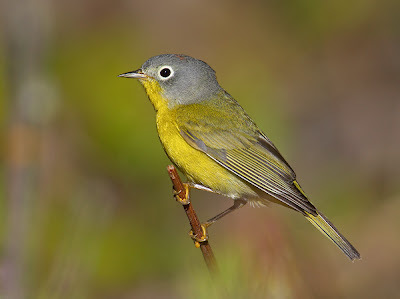 I decided to test out my "pishing" skills and I was instantly rewarded with the cutest little Nashville Warbler that approached to within three feet of me and checked me out. Its colors were brilliant and sharp. Yellow belly, gray head, white eye-ring, and a very green back. A couple of Song Sparrows responded as well. Down among a pile of branches a House Wren skipped along. Ah...Paradise! Those of you that have been to our Avimor Bird Walks may be familiar with the Avimor Bird Guide booklet that I put together. It has now been updated. I had to add two whole new pages of birds that have been seen at Avimor this year that were not in the original guide book. Free copies of the Avimor Bird Guide are available to the public. You can pick up a full color copy of it at the Avimor Sales Office or I can send you a version of it by e-mail. Just click on the "Ask the Avimor Bird Guy" button in the right column to request your copy. I was notified a recently by e-mail from the TV host of a new TV series about Birding, called Birding Adventures on the Fox Sports Network (FSN). In my area it is broadcast Saturday mornings. I set up my DVR to record the half hour show and I've watch a couple of episodes now. James Currie asked me to let other birders know about the new show, but I figured I'd review it before I endorsed it. Overall, I like Birding Adventures. James Currie the host, originally from South Africa, with his his accent, is somewhat Crocodile Hunter-esque in his presentation; very energetic and often in intense whispers. The show does side-track into other cool things that they happen to be seeing along the birding trail, which is fine by me, because that is my reality too. My only complaint about the show is that it is not in hi-definition so the cinematography doesn't show well on my hi-def screen. Perhaps with a few more viewers and a larger budget they can take it to that next level. It was great birding this morning at Avimor along Spring Valley Creek! 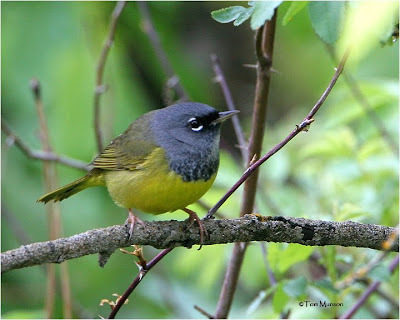 I had another Avimor official record first: a pair of MacGillivray's Warblers. Another bird of great interest to me was group of Warbling Vireos. I doesn't matter how many times I see them, but I am amazed every time I see the Spotted Towhee, Great Horned Owl, and Downy Woodpecker. I was also surprised to have the four juvenile Western Tanagers and several juvenile Lazuli Buntings. The Black-headed Grosbeaks weren't afraid of me at all this morning as they fed on plants within a few feet of me. From Tim in Kuna, ID: "What kind of nectar do you put in your feeder?" Experts warn against using any other types of sugar other than granular sugar from sugar cane or sugar beets. Don't use corn syrup or any other sweeteners. Food coloring is simply not necessary and some people think it may have harmful effects. A clean feeder is very important to prevent the spread of diseases. I'm also testing out a fully recyclable feeder from The Humm sent to me from the Celebrate Urban Birds folks as a gift for hosting our event back in May. You can use an average plastic water battle. 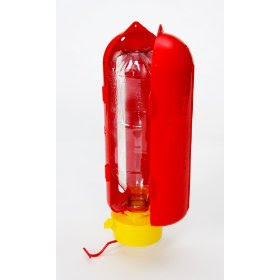 The bottle cap feeder and perch can be recycled after each use so you never have to clean anything and you can insure a clean feeder every time. Hummingbirds seem to like it just fine! The fall migration for hummingbirds through the foothills north of Boise, Idaho is in full swing. At my home in Avimor, we've been getting around a dozen Black-chinned Hummingbirds at a time at our two feeders. This morning we had two Rufous Hummingbirds join in the party. 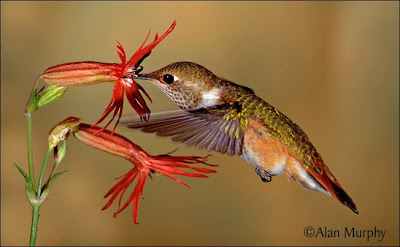 "Rufous" is a color by the way, which can be seen on the flanks and in the splayed tail feathers of female and juvenile Rufous Hummingbirds (see above photo). We are no longer seeing adult male hummingbirds of either species. The Swainson Hawks are still hanging out in the cottonwoods near the Avimor entrance. They are very vocal recently. I'm not sure why. This morning I also observed Cedar Waxwings, Black-capped Chickadees, a Spotted Sandpiper at the Town Lake. The summer regulars are still hanging around like Western Meadowlark, American Goldfinch, Yellow Warbler, Mourning Doves, Western Wood-Pewee and California Quail. A couple of Gray Catbirds are still around and can be heard meowing in the thick brush along the creek. Say's Phoebes seem to be enjoying a gluttonous lifestyle feasting on the massive invasion of grasshoppers and mormon crickets. The Lazuli Bunting's, Bullock's Orioles, and Black-headed Grosbeaks are getting much fewer and farther between. All the varieties of blackbirds have evacuated in the last couple of weeks. Any guesses when our winter residents like Dark-eyed Juncos and White-crowned Sparrows will show up? eBird data suggests that late September will be the most likely time to see our winter guests arrive. This blog was created with the original purpose of sharing my joy of birding with those in my specific community. In the last few months my birding blog interests have expanded to include regular interviews with Idaho Birders, reviews of products and books, and reports of my birding adventures outside of my community. My enthusiasm for birding and blogging along with readership continue to grow. I am happy to receive financial support to sustain my hobby and passion while at the same time promoting products or services that I can personally endorse. Any company wishing to promote feeders or seed products, let’s talk! I am very interested in providing a weekly blog segment on Idaho Backyard Birding featuring your products. Donation of your products would be deemed as payment. If you are interested in advertising on this site, please contact me to make specific arrangements. To send me an e-mail, please click on the "Ask the Avimor Bird Guy" icon in the sidebar. 3. Logos and graphics should be sent to me by e-mail. 5. PayPal is the preferred method for payment, but other arrangements can be made. 6. I may be agreeable to in-store credit rather than payment. Yesterday I had the distrinct privilege to take an Avimor history tour with Red & Polly Ward (both 87 years old) and Tom Blessinger. Shon and Cliff from Avimor accompanied us, with Cliff providing much of the expert driving. These folks know a lot about the history of the land and the people that lived and worked it. 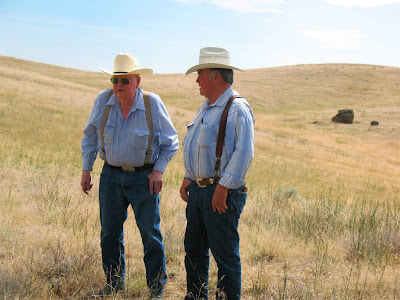 We went four-wheeling over thousands of acres stopping at homestead and school sites marked only by a few locust trees and maybe some old pieces of rock foundation. We heard non-stop stories about the people and places all day long. It was absolutely fascinating and awe inspiring. I hope the booklet I put together on it will do it some amount of justice while preserving a wonderful piece of Idaho history before those that remember pass on. Along the way, of course I kept track of the bird species I was seeing. I saw 25 species. 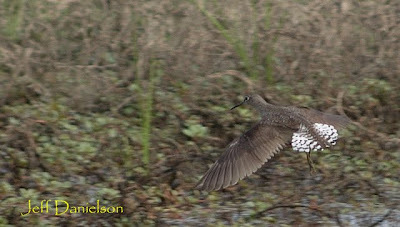 Not bad for birding not being my primary focus. 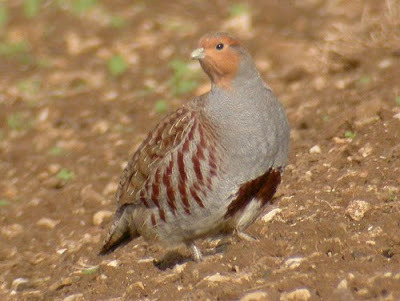 The birds of the day had to be the large covey of adult and juvenile Gray Partridge (known locally as "Huns", which is short for "Hungarian Partridge". These were seen at what I've been calling the Chinese Well Riparian area just on the west side of Hwy 55 across from the Avimor construction trailer. I have only seen Gray Partridge at Avimor one other time on Broken Horn Road, so this sighting was pretty cool. It is especially exciting to see such a successful and large brood, giving me hope that the Gray Partridges continue to multiply even as a highly hunted upland gamebird. In an effort to step up my birding game and for the fun of a personal challenge, I am going field guide-less in the field. I'm forcing myself to look harder at the bird, to take good notes about every possible feature and even to try drawing it. After I get home, then I allow myself to look it up. Please bare with me as I struggle along. 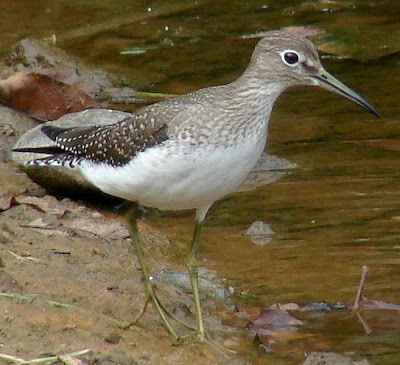 5. and the least scientific reason: A Google Image search of Solitary Sandpipers has many photos that match the "general impression" of what I was seeing tonight, especially the contrast between the head/neck color and the wing color. The hard part comes in that I don't recall white spotting on the upper parts. It could have been the lighting conditions or the age of the bird. Any tips or suggestions for improving my field note taking will be shamelessly welcomed. Pictured is my son Kyle holding a Black-chinned Hummingbird right after Fred had banded it and taken metrics. Special thanks to Michael Wiegand for hosting the Avimor Bird Walk and the public in general for the annual hummingbird banding at his home in Pearl, Idaho. Thanks to Fred Bassett for the hummingbird education. 40 to 50 people braved the morning drizzle to attend the event. I'll get the total banding count from Michael later, but we caught mostly Black-chinned Hummingbirds and a couple Rufous Hummingbirds. Children as well as adults were amazed to feel their little heartbeat in our hands. One little Black-chinned was caught a total of 4 times this morning. I guess it liked being caught. While not the most amazing bird ever seen at Avimor, nor an extremely special observation, my sighting this morning of a Rock Pigeon on top of one of our model homes is still an Avimor first (on the official record anyway). 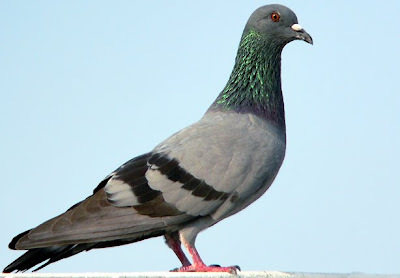 I find Rock Pigeons all the time in many urban areas as well as rocky cliff areas. The cliffs above Swan Falls along the Snake River is full of them. In the Meridian and Nampa areas, I often see them in agricultural fields. Until recently, they were called Rock Doves in many bird guides. Is this lone Pigeon the first of many more to come as we have created this small pocket of homes in the foothills? Whenever I see one of these birds I can't help but start singing to myself the Seasame Street classic from my kid's video featuring Bert "Doin' the Pigeon" song and dance.